Connemara Ponies are Ireland’s native pony originally from Galway. Their popularity is extensive worldwide. They are a historic breed that is considered to be “sure footed and hardy”. Connemara ponies have a calm temperament, staying power, intelligence, soundness, and athleticism. They are considered to be a wonderful modern riding mount for children and adults alike. The exact origins of Connemara Ponies are difficult to decipher and are immersed in myth and fable.The general consensus is that the history of the breed started with the arrival of the Celts in Ireland. The Celts traveled across Northern Europe, through England, Scotland, and Wales, arriving eventually on the West Coast of Ireland over 2,500 years ago. , Battle was a fundamental component of Celtic custom and in this they relied heavily on their hardy ponies, using them in pairs to draw battle chariots. When the Celts arrived in Ireland they brought with them herds of these dun ponies, taking up residence in the district known today as Connemara. It was here that their ponies crossed, in due course, with the indigenous breed and found a sanctuary of their continuance and development, which remained uninterrupted for sixteen centuries. Throughout the years herds of ponies roamed the hills of West Connaught. The harsh conditions gave rise to an active, sure-footed and clever breed. In such an environment weaklings fail and only the toughest survive to reproduce. Evolving in such a climate bestowed on the breed attributes of extreme hardiness, strength, and endurance. Accounts exist of Spanish blood being introduced into the breed, though the particulars of how and when this transpired are uncertain. A popular legend recounts that when the ships of the Spanish Armada were wrecked off the West Coast of Ireland in 1588, Andalusian stallions scrambled ashore and mixed with herds of Connemara Ponies running wild in the hills. 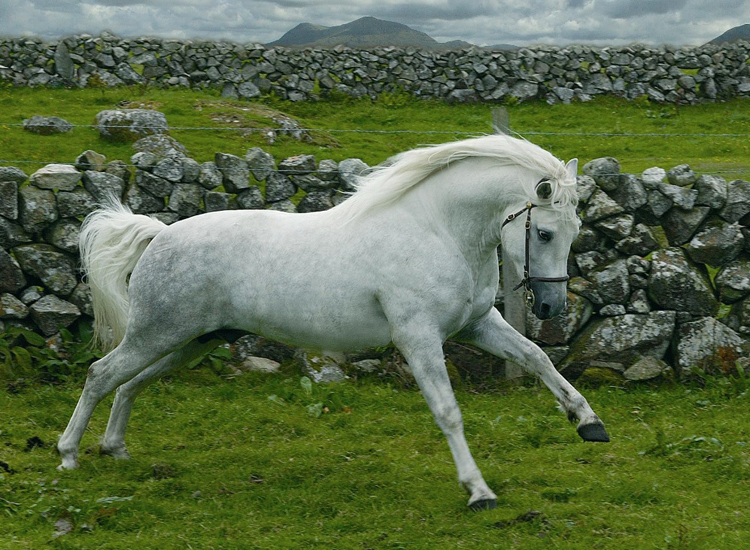 It is believed that Spanish Barb and Andalusian horses were also imported at this time and several of these horses were said to have found their way to Connemara and crossed with the native pony breed. More recently, in the 18th and 19th century, Connemara Ponies increasingly began to resemble Arab horses. It is understood that several estate owners in Connemara imported Arab horses, which in due course crossed with the native ponies. In the 1820’s and 1830’s Connemara was a densely populated region with farmers endeavoring to eke out an existence on small pieces of land. Farming the land of the West Coast of Ireland was a difficult undertaking and was almost impossible without the assistance of a good work pony. The work of the ponies varied throughout the year. They were often seen scouring the hillside laden with seaweed, seed corn, potatoes, turf, oats, or barley. They conveyed produce to the market and returning from the market each pony generally carried at least two men. Mares were required to produce a foal annually, which would be sold at six to eight months, providing much needed income for a household, sustaining them through the bleak winter months. In the summer and autumn the ponies were often seen trudging along, all but buried in a huge pile of hay or oats, each with a puzzled foal bringing up the rear. It was apparent that the ponies of the West of Ireland were obliged to do the work of pack horses and to be strong, agile, and tireless. When a pony was incapable of carrying out the chores demanded of it, it was replaced by one that could. Given the nature of the work the Connemara Pony was expected to perform and the ‘wild’ conditions in which they developed, the breed evolved to be both strong and resilient in constitution. In the middle of the 19th century both the number of ponies and the quality of the breed were greatly diminished. Many ponies had been exported to England for use in coal pits; however the main reason for the decline in the breed was the condition to which the country was reduced in the time of the great famine. The onset of the famine in Ireland in 1845 had a massive effect on the pony population, changing the state of the breed drastically within a few short years. Farmers were impoverished by the failure of the potato crop and were forced to sell their mares. Oppression, starvation, and disease gripped the country. Many of the small farmers that owned ponies were evicted from their farms, fled the country, or died. Famine and emigration devastated the population of Connemara. When times improved, towards the end of the century, farmers did not have the means to buy new ponies and replaced them. Over the years a number of people endeavored to make the plight of the Connemara Pony known to both the breeders and the general public. Amidst growing concern for the deterioration of the breed a meeting was held in Oughterard, Co. Galway in December 1923, which ultimately lead to the formation of the Connemara Pony Breeders’ Society. The newly formed breed society made quick progress, securing funding and setting up inspections. By 1939 the foundation stock had been secured, breeders had become more mindful about the animals from which they bred and the quality of Connemara Ponies being produced had improved markedly. Concern began to grow that the Connemara Pony’s gene pool was becoming too narrow and that fresh blood should be introduced. Between 1940 and 1960 a limited number of half-breds sired by Thoroughbred, Irish Draught and Arab stallions were registered as Connemara Ponies. In 1964 the Connemara Pony Stud Book was closed and subsequently only ponies with both a sire and a dam registered as Connemara Ponies can enter the Studbook. Towards the middle of the 20th century farming became increasingly mechanized and the role that the Connemara Pony had secured for centuries as a working pony began to disappear. Fortunately the demise of the Connemara Pony as a working animal did not preempt a massive reduction in population size. An export market developed for the breed in the 1940’s with buyers from England and the United States becoming increasingly interested in the native breed. In the 1980’s the number of people taking up riding as a leisure sport increased, and a new market opened up for the Connemara Pony. Within a few decades the role of the Connemara Pony quickly changed from that of the working animal on a small farm to that of the versatile sporting pony. Connemara Ponies are infamous for their great stamina and versatility. They are capable of carrying an adult in the hunt field, yet gentle enough for a young child, fearless as a showjumper, yet suitable and steady as a driving pony. These attributes make the Connemara Pony an ideal riding, hunting and performance animal and have enabled them to establish a secure position in the riding industry. Today there are approximately 2,000 foals born per year in Ireland and they are now recognized throughout the world as a top class performance pony.